Getting to Mars isn’t going to be easy or cheap. Landing and staying on Mars is going to be much more expensive and quite a bit more difficult. Most experts agree that we can probably land a few people on Mars for around $100 billion – approximately the price of the International Space Station. Once we get the engineering down, subsequent trips would cost far less than the first couple of forays onto the Martian surface. Creating a mostly-self sustaining colony on Mars makes far more sense than either creating one in low-Earth orbit or on the Moon since the round trip to Mars is on the scale of months in a best case scenario, while it’s only a couple of days to get to and from the Moon and hours to get to the ISS. Putting colonists – essentially researchers – on the red planet for years at a time, to be swapped out by others if they so wish. Funding is going to be an issue for the next several decades at least, but NASA could realistically start a Mars colony within 20 years with just a small increase in their annual budget. 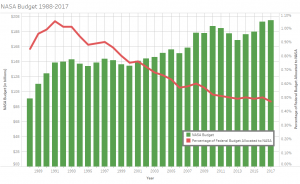 Right now, NASA makes up about one-half of one percent of the Federal budget but the effects of that spending positively impact everyone in America and has been doing so since the 1970s. By increasing that to 1%, it appears as though the space program could employ an extra 100,000 individuals and focus billions of dollars per year on establishing a Mars colony. The vast majority of that money would go right back into American communities. Of course, a trip to Mars takes astronauts well outside of the Earth’s magnetic field, exposing them to far more radiation than residents aboard the ISS receive. NASA would likely take a multi-pronged approach to solving this issue, involving some combination of medication, shielding, and spacecraft configuration. Radiation medication could dramatically improve cancer survival rates if doctors can be extremely aggressive in treating tumors with radiation. More effective radiation shielding could lead to improvements in nuclear power plant design, reducing our dependence on fossil fuels. The list of tangible benefits goes on and on. Allocating 30% of the increase to a Mars mission gets us well past the $100 billion it would take to put it into action, more than enough to setup the initial Martian infrastructure and start sending regular supply missions.